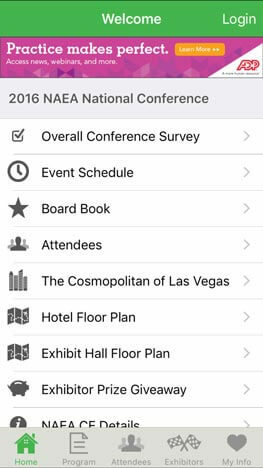 Your conference agenda can be programmed so that attendees can view their schedules by tracks and topics. 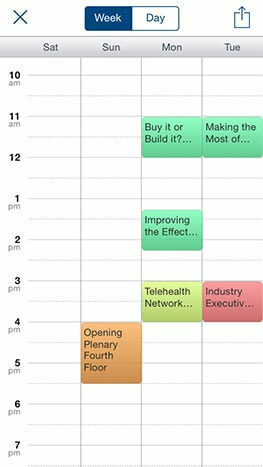 Tracks may be color coded for easy identification when viewing the entire schedule or a personalized schedule. Program listing by tracks and track groups. Use headings to organize tracks by category. 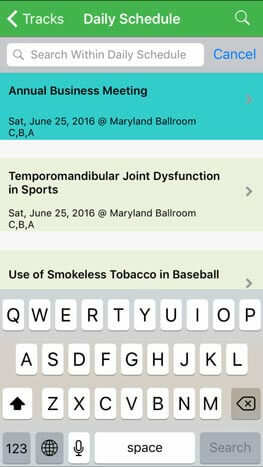 Use the Search function to find a session based on a topic! 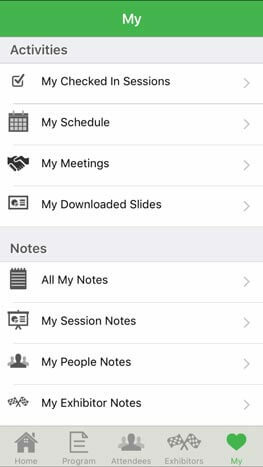 Participants can mark sessions as favorites or add them to their schedule, which can then be exported to their device calendar! 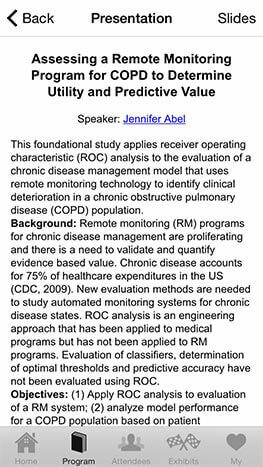 Click on the Session title to get time, location and speaker roster. 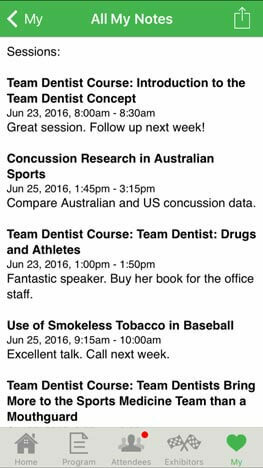 Click on a session and add it to your personal calendar. 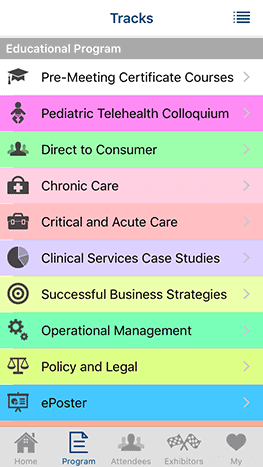 Tap on a session to reveal details. Take notes on sessions, fellow attendees, and exhibitors…and instantly email them to yourself or a colleague. 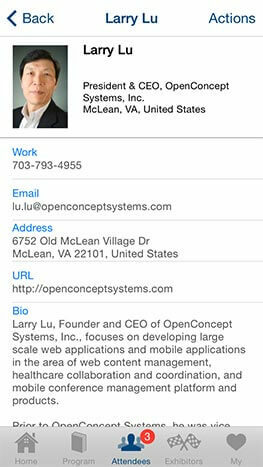 One convenient directory for your personalized schedule, notes, and the slides you’ve already downloaded. 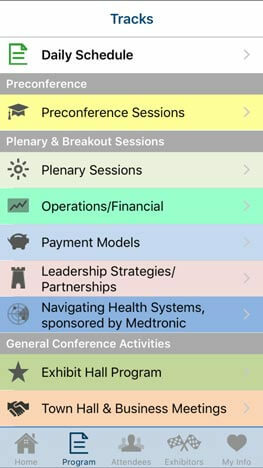 Tap on a session to view details, such as speakers, bios, location map, and presentation slides. 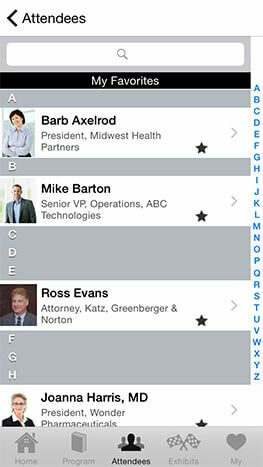 View speaker bios, the sessions in which they appear, bookmark favorites, write notes, and connect with them. Notes for each session can be saved and bulk exported. 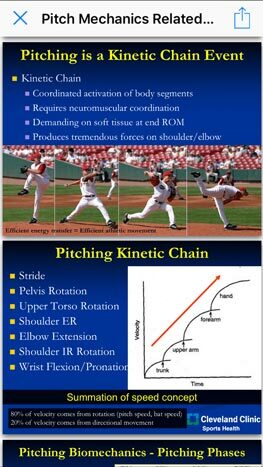 Slides are attached to the session and can be forwarded by email and printed virtually. Incorporate important abstracts and supporting documentation. 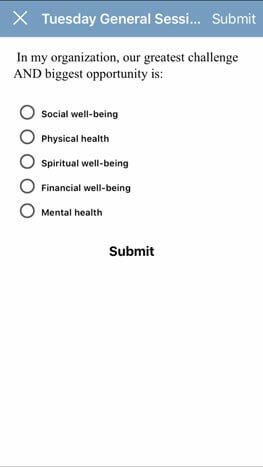 Attendees will enjoy asking questions through our Question Board, rating sessions and speakers, and taking instant polls that you can project on large screen! Conduct an instant poll! 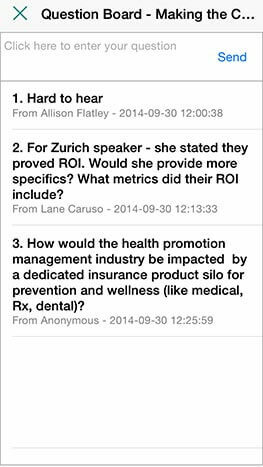 Pose a question, then watch the audience results as they’re projected on the big screen. 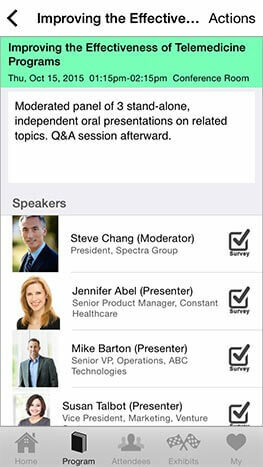 Attendees can send questions to the panel moderator or speaker in real time. 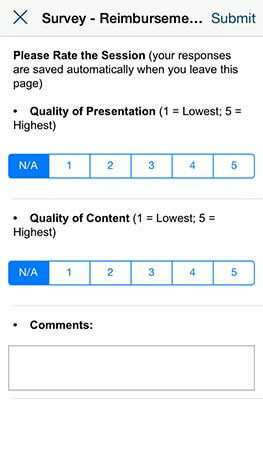 Submit feedback and rate sessions instantly. 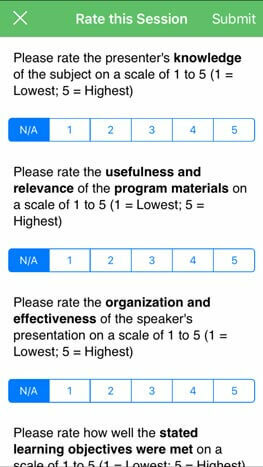 Rate the speaker’s effectiveness and provide valuable insights to the conference organizers. 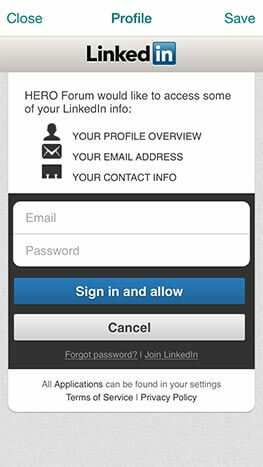 It’s easy for attendees to find one another, save contacts to their address book, exchange virtual business cards, and chat within established special interest groups. 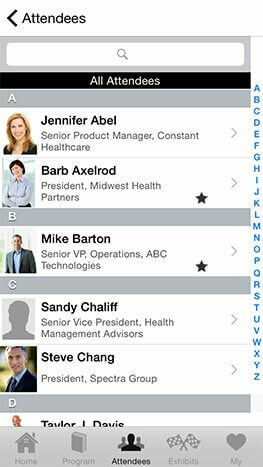 Search the easy to use attendee list by name, company, or other attributes. read bio and contact info. 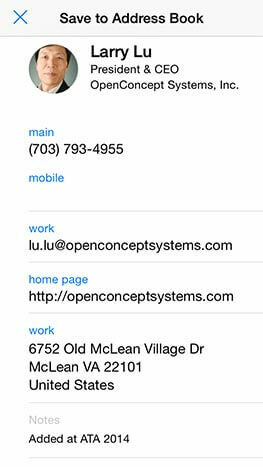 Save contact info to your address book. 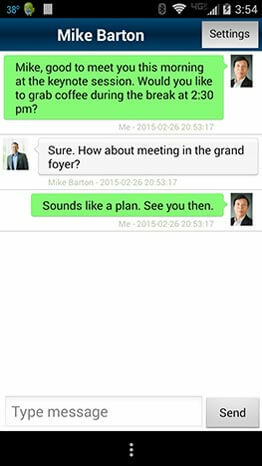 Use the chat feature to connect instantly with fellow attendees! 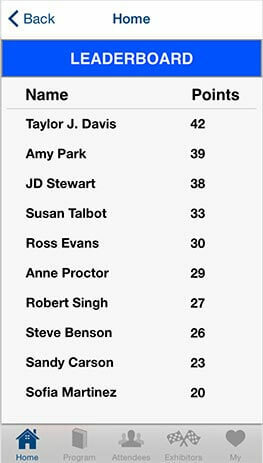 Add speakers or other attendees as favorites for future contact. Import feature lets attendees complete their event profiles. Attendee can self-select into special interest group to enhance interaction. Capture the fun of special promotions, incentives and competitions. 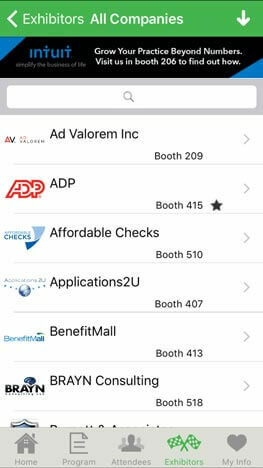 Exhibitors shine in this mobile app. 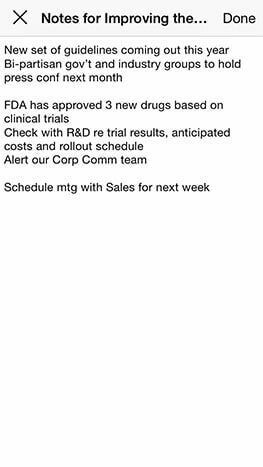 Detailed listings with links to their website, phone, and email. Attendees and exhibitors can exchange contact info. 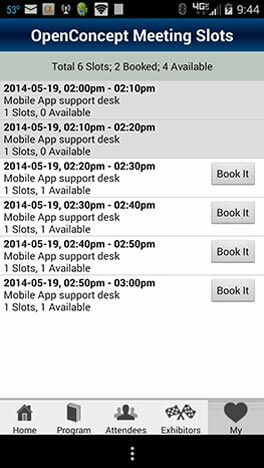 Plus, we’ve got appointment-setting functionality, for those one-on-one important conversations. 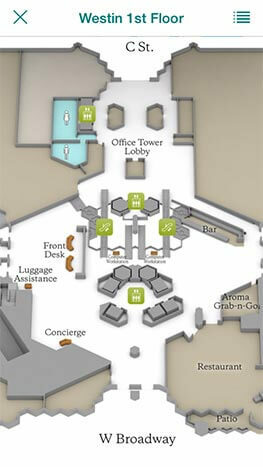 Integrate the venue map for easy attendee navigation. 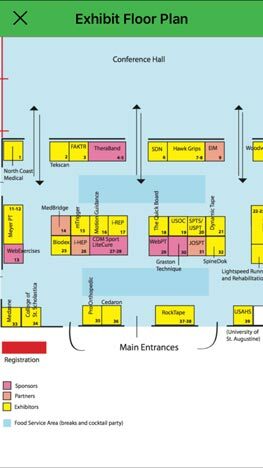 View the exhibitor area and pinpoint the booths and displays you wish to visit. 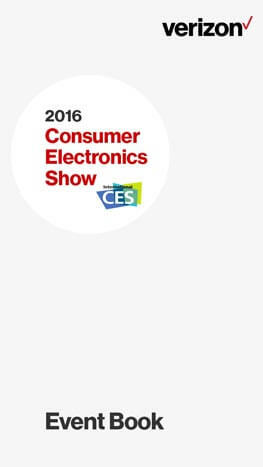 Search for exhibitors by name, booth number, or other attributes; mark the exhibitors you want to meet. Book meetings with exhibitors to speak in-depth with their representatives at the conference. 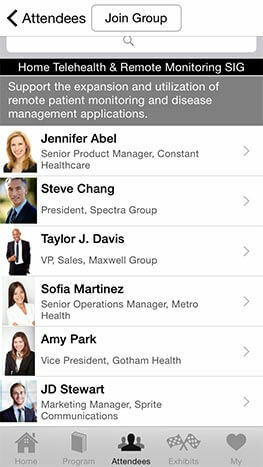 Deliver value to key sponsors by merchandising the prime real estate in your app. 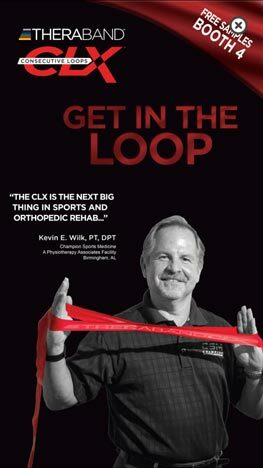 Examples include the opening screen and a rotating banner at the top of the program schedule. time the app is opened. Clickable ad banner above the agenda and other screens maintains the sponsor’s presence throughout the event. Like what you see? Get a live virtual demo from one of our team members. Let’s discuss how AgendaPop can help with your next conference or meeting.